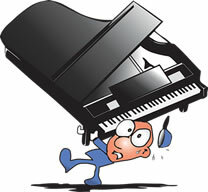 Since our incorporation in March of 1978, Keyboard Carriers has moved over 100,000 pianos and keyboards within Colorado. We specialize in only two services: moving and storage. Although we don't tune, refinish, rebuild, repair, rent or sell pianos, we have many clients who do all those things, and we are happy to give you a recommendation. All moves include full insurance for your instrument and property. Our moving work week is Tuesday through Saturday, and we are in the office Monday through Saturday. To be safe, please give us a week's notice to schedule a move and more if the move is outside the metro area, but we do our best to accommodate any last-minute needs. We accept checks, cash, Visa and MasterCard. Our crew members are experienced, friendly and non-smoking. 100% customer satisfaction is our goal, and we will do everything we can to ensure you are happy with our services. Our clients include Schmitt Music, Pianos n' Pianos, Neighborhood Music Stapleton, Woods & Son Piano Co., the Colorado Symphony, Denver Public Schools, dozens of refinishers, rebuilders and piano teachers, hundreds of churches, and thousands of individuals who use us over and over when they need their instruments moved professionally. The reason we are "Colorado's Most Recommended Piano Mover" is our history of reliability, professionalism, and piano moving expertise.